It all seemed so simple. I wanted to install my trusty copy of Groove Agent 3 on a new Mac OS Lion box. The license is on my eLicenser already. So it should just be a quick insert-DVD-and-install job. I've been using Groove Agent for years now. My version 3 DVD was an upgrade disk from the original version 1. If you run that DVD's installer it says you have to have version 1 installed to upgrade. That seems fair enough. Except you can't install Version 1 on Lion; it is an old PPC application, and Lion doesn't support Rosetta any more. It's a deadly circle; I now legitimately own some (not inexpensive) software that I can't install. Pete is not a happy bunny. I sent a tech support email through my Steinberg account. Not with much hope, I have to admit. That was ages ago. What do you think happened? Yup, you're right. Not even got a "we've got your message and it's in a queue" reply. Thanks, Steinberg. Thanks a bunch. The Groove Agent 3 support site has a few update installers available (which, naturally, need the full program installed first to be able to update). There is also a new "full installer" for the Mac to replace the DVD's installer for first-time users. This shows great promise. Once downloaded, I run the installer. "Insert the Content DVD" it asks (impolitely). OK, again this is fair enough. The content is enormous, and is on the DVD already so I shouldn't need to download that again. It also proves that I own the product I'm installing. I insert my Groove Agent 3 DVD into the machine. The installer doesn't recognise it. No message. No hint. No continue button. It just sits there. Of course, it's looking for the "Groove Agent Installation DVD" not the "Groove Agent Update Installation DVD". Swines. Being a techie I wonder. I wonder how rubbish they really are... Is the installer just looking for a DVD called a certain name? ln -s "/Volumes/Groove Agent Update DVD" "/Volumes/Groove Agent DVD"
The installer runs, it copies over the content from the DVD and there's my Groove Agent 3 sitting there, ready to run. I fire up Cubase, pull in the virtual instrument, and a window pops up asking me to locate the content files. That's the content that the installer just installed. Into a standard place. Didn't it think to look there itself? Sheesh. That's OK, I'll just use the file browser dialogue that appears to load it. Except that the content is automatically installed into "/Library/Application Support/Steinberg/Groove Agent". Notice that first bit. Yes, "/Library". The folder that Apple now HIDES from users in Lion so they can't fry in innards of their OS. I physically can't navigate to the content. Genius. The trick, of course, is to launch Finder, open the "Go" menu, and hold down the Command key. At this point "Library" magically appears in the middle of the menu's list of places you can go to. Select that folder. Navigate to the right directory in the Finder window that appears, and then drag the target directory into the patiently waiting application's file open dialogue. But that's it, I now definitely have Groove Agent 3 installed and running. Of course, I have a clue what's going on inside my computer, and was able to engineer this solution based on my experience and a selection of educated guesses. Goodness only knows what the average user would be able to make of this situation. It seems that every time I want to sit down an use my computer to make music, the computer wants some love, wants its nappy changed, or wants feeding first. New driver required! Update available! Incompatibility detected! Technology really can get in the way of being creative. Hi Pete - not being a techie but having the same issues I've read your blog with undivided attention. Any more hints from your side to deal with that problem will be warmly welcomed! Thanks to all you guys out there sharing those vital knowledge about music and computers. Let me know what you've tried to change, and what doesn't save. Then I might have a useful hint! Where can i fin this? an what do i do with it? Sorry This is not easy for me, exactly how do i do it, i tried to write it in the terminal but i don't know exactly what signs and i should write is " meant to be written in? is it an L or a big i in the beginning, is it a empty stroke between? Sorry i am no programmer , i just want to make my favorite drum program to work in osx lion. It works,like magic, i just manually put the files at their places ( as SL) and started Cubase...there it is! Thanks though for inspiring me to continue trying. Just f.y.i., in any file dialog you can hit shift-command-g to bring up the "Go to..." dialog and type whatever you want. No need to go to the Finder for that. Firstly, Pete Goodliffe, let me buy you a beer or make a donation to your site!! I purchased a copy of GA3 solely on your blog info and, in the end, got GA3 up and running on my MPB OS X 10.7. However, this VST2 instrument is not visible in Cubase 6, only the VST3 instruments, so I am using the stand alone GA3, and ReWire to connect to Cubase 6. Of course, the standalone will only run once the latest update from Steinberg is applied. If anyone has insight into this VST instrument issue, I would appreciate a response. I'm glad this is useful! Just to let you know that the GA3 VST works fine in Cubase 6. No problems at all here. I suggest you check what path it installed to, and that your Cubase VST settings are set to look there. It might be worth verifying that GA3 works ok in another host (Reaper, or something). Perhaps the VST didn't install properly, which is why you can only use the standalone? Any idea of how to get it all happening in OX10.8.2? I've got GA3 up as a standalone at last... and opening in rewire mode. Though not usable as as soon as I go to GA3 it stops playing! Why oh why won't Steinberg support GA3? It's a FANTASTIC bit of software that I use on absolutely every bit of music I make. Sorry, not needed to reinstall like this for 10.8 yet. I would have imagined that it'd just need the same trick. 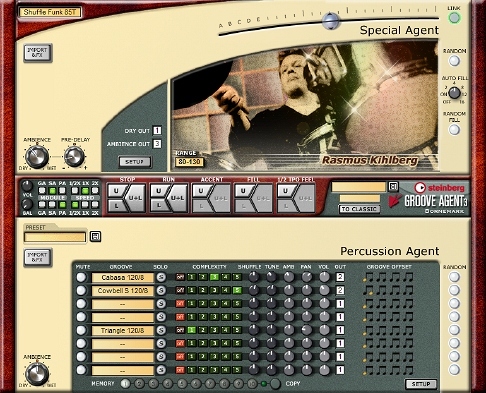 Have you taken the latest updates from http://www.steinberg.net/en/products/vst/grooveagent3_product/grooveagent3_system.html ?